It’s September and, as season wants, the vineyards over here are bursting with lush, fragrant bunches of grapes ready to be gathered. 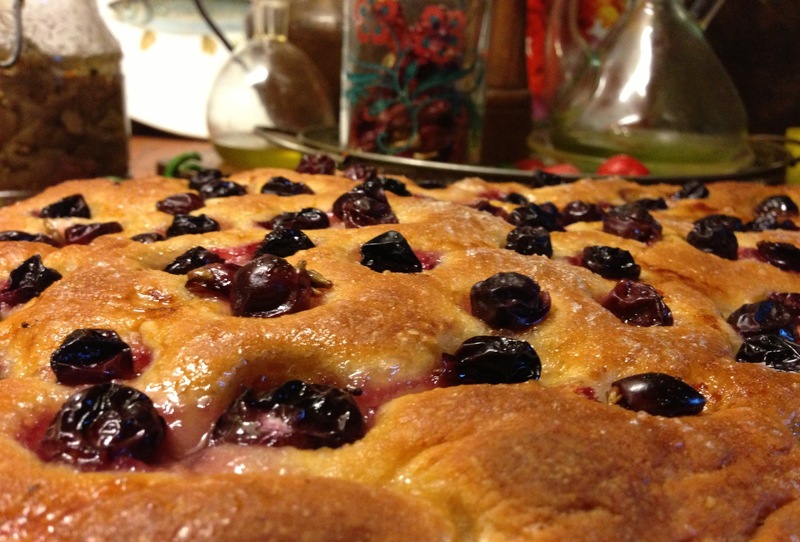 As by Tuscan folk tradition, then, this is the period of the Pan coll’uva, the grape bread. 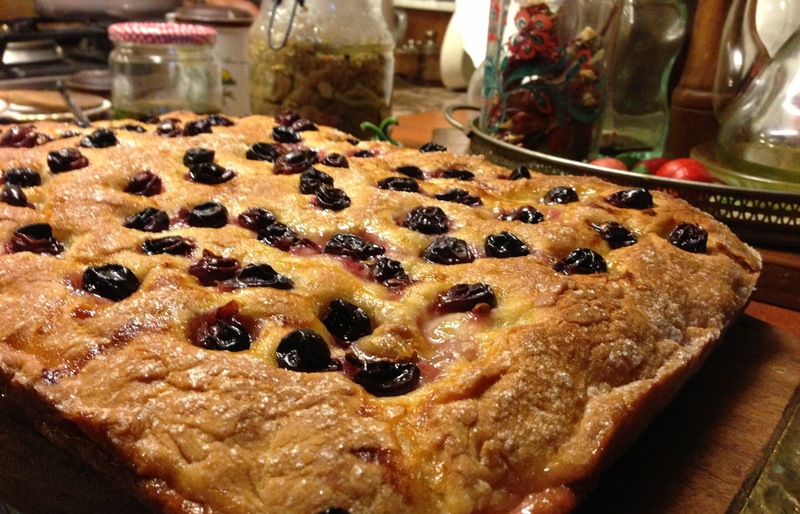 Typical of the areas of Florence and Prato, this sweet focaccia with grapes is also made in the Maremma inlands where it goes by the name of schiaccia con l’uva, the grape flatbread. 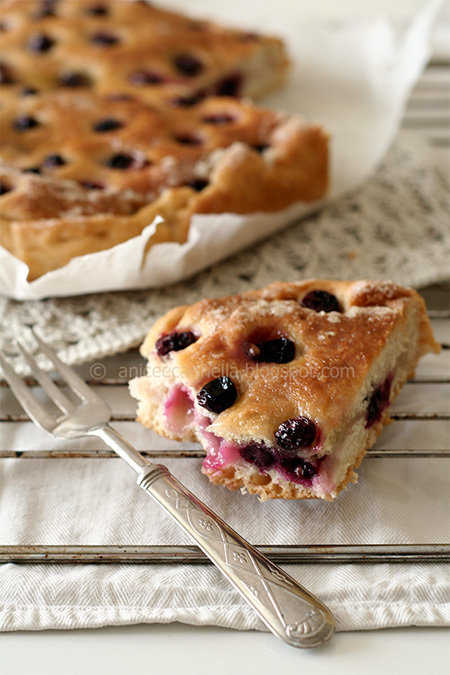 This characteristic Tuscan cake is cooked during the harvest period, using the grapes less suitable for making wine, the canaiola variety, considered of lower quality for its tiny berries full of seeds. And as by tradition, simple, but genuine, ingredients are used for this sweet bread that was intended for the men after a long and tiring day in the vineyards during a well-deserved break. This cake was made to gather everyone around a laid table, to forget the fatigue of the day under the sun and to celebrate the harvest just finished, or as an afternoon snack in the vineyard. As with all folk recipes, the original has changed during the years, adjusting to tastes and likings, some preferring it higher, others lower, some adding the spices they prefer or a tastier sugar. Whatever the choice, one tradition remains: the grape bread must strictly be eaten cold, so that the taste can adjust to the union between grape and sugar, turning every morsel into a sublime experience. Why not give it a try? 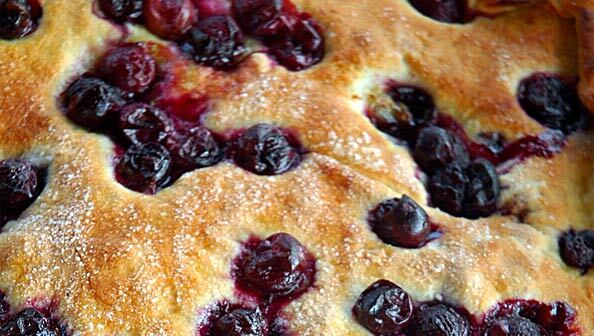 Ingredients: 700 g of small black grapes, 300 g of plain flour, 10 g of fresh baker’s yeast, 200 ml of lukewarm water, 2 tablespoons of extra virgin olive oil, 1 teaspoon of salt, 2 tablespoons of sugar + either 7/8 for covering. In a bowl put the flour, the yeast, the olive oil and the sugar. Add the lukewarm water slowly and start kneading as with bread, continuing to add water and kneading all the time. Once done add the salt and shape into a ball. Leave it to rise for a couple of hours covered with a tea towel and far from possible temperature variations. In the meanwhile wash the grapes and dry them. Once the dough has risen separate it into 2 balls, one slightly larger than the other. 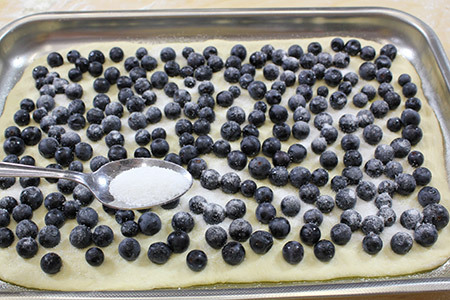 Roll the bigger one on a baking sheet covered with flour. Take a 26 x 32 cm baking tin, pour a trickle of olive oil and place the rolled dough, eliminating the surplus around the edges, leaving however a high rim. 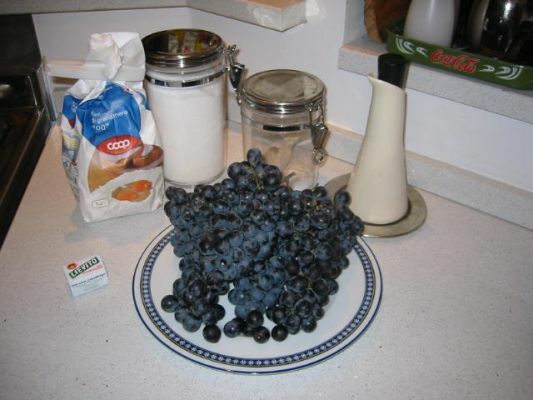 Cut some of the grapes with a knife, so that they release some juice, and spread them on top. Then cover it all with 350 g of grapes. Sprinkle 3/4 tablespoons of sugar and pour a trickle of olive oil. Now roll the remaining dough and delicately place over the grapes. Eliminate the surplus dough, pull up and over this the rim of the dough below and seal the edges with a fork. 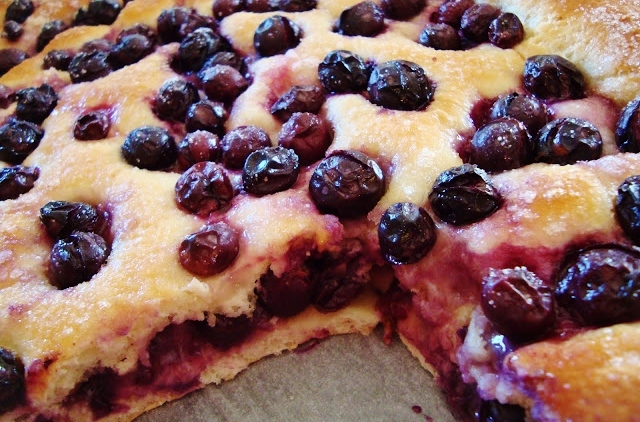 Decorate the upper layer with the remaining grapes. 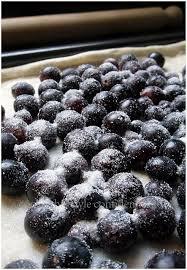 Sprinkle the grapes with another 3/4 tablespoons of sugar and another trickle of olive oil. Turn on the oven and bake for 50/60 minutes at 150 °C, or a least until golden. 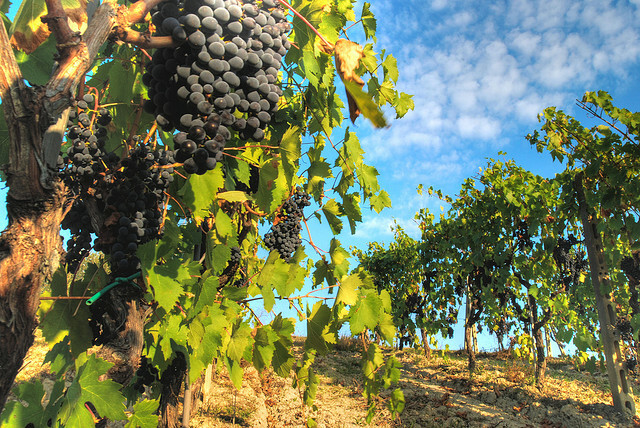 Questa voce è stata pubblicata in Accommodations in Tuscany, Culture and accommodations in Tuscany, Tuscan food and wine, Tuscan lifestyle, Tuscan recipes e contrassegnata con Chianti wine, Tuscan food and wine, Tuscan grapes, Tuscan recipe. Contrassegna il permalink.